Stylish enough for a day at the office and comfortable enough to wear on weekends, this fleece customized sweatshirt features a full front zipper to change up your look with the weather. 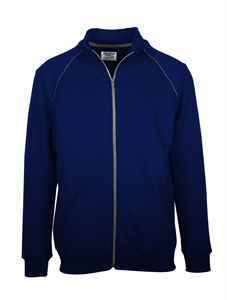 Made with 75% cotton / 25% polyester preshrunk yarn, this fleece custom full zip sweatshirt delivers comfort with sophisticated style. Pouch pockets keep your hands warm while 1x1 rib knit spandex provide a comfortable fit. Double-needle stitching at the waistband and cuffs provide durability, ensuring this custom embroidered sweatshirt stands the test of time. A YKK brass zipper with contrast grey trim and jersey piping for a raglan effect on the front and back give this custom sweatshirt added style. 14 oz.